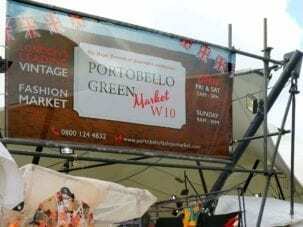 Premium PVC Scaffold Banners 500gsm. 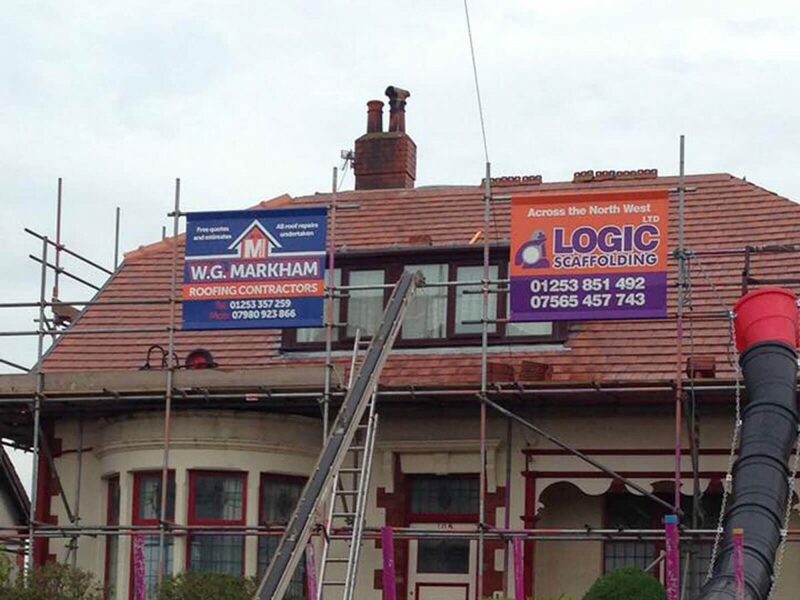 Our most popular single sided scaffold banners. A high-quality product at the lowest possible prices guaranteed! This premium, class-leading banner is ideal for long-term outdoor use. Manufactured from heavyweight, top specification 500gsm PVC tear resistant banner material. This material is the best on the market and is near impossible to tear. The structure is reinforced from a fine nylon cross weave in the core of the material, giving it unbeatable strength and durability. 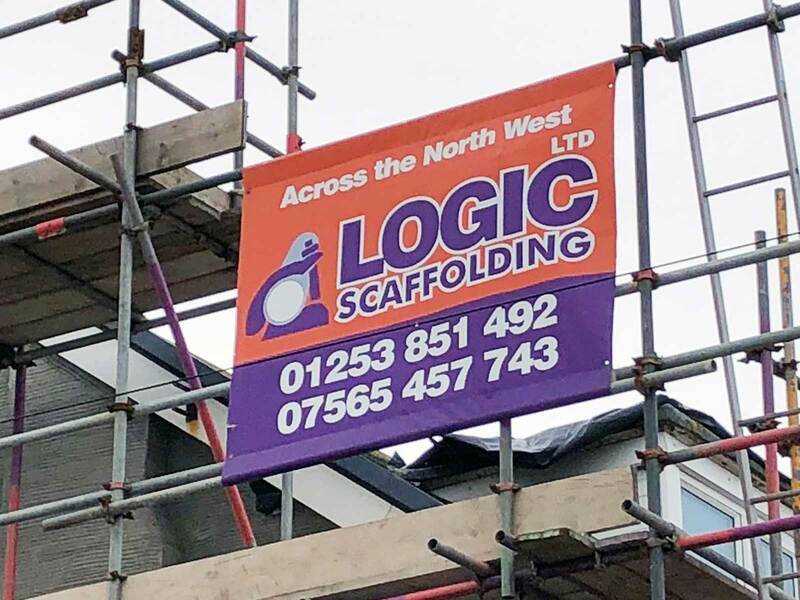 Do not compare this to the cheap laminated banners that other competitors are using and which are totally unsuitable for use on Scaffolding. Our pockets are heat welded as standard. Add extra strength to your pole pockets with additional stitching . Add a reinforced stitched pocket and we will heat weld and then over-stitch your pockets. 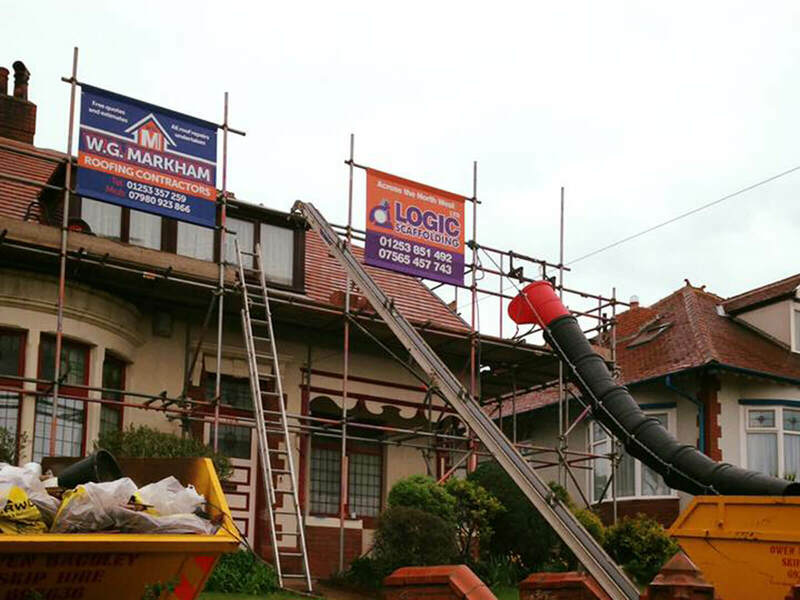 This process gives extra strength, durability and longevity to your scaffold banners. Reinforced Pocket Price (SQM) (£2.00) This must be a number! BLEED FOR BANNERS: No Thanks, No bleed is required on your artwork. CLEAR AREA:Please leave a clear area of 50mm to allow for eyelets. (Please ensure that all text / logos / critical information is more than 50mm from the edge of your artwork) Background colours and images are fine going into the clear areas. YOUR ARTWORK WILL BE CHECKED: We will check your artwork to ensure that it is suitable, prior to going to print. We cannot guarantee to spot any spelling or grammar issues, but if we consider your file to be insufficient, we will advise. DISCLAIMER: Please ensure that your artwork is set correctly before uploading. We (Banner World) will always try our best to spot errors where possible on your behalf before production. If we are aware of an error we will contact you before production and request new artwork. Banner World will not be held responsible for artwork / setup or spelling errors. Banner World will not be held responsible for missed deadlines due to delays in receiving new artwork. By selecting the electronic proof option we will send you an electronic proof of your submitted artwork by email. You will be given 24 hours to sign off your electronic proof, after 24 hours the order will be processed without sign off Please note: any delay in approving the electronic proof can delay turnaround times. Smaller, one-off trade banners can be produced much quicker – standard turnaround is 2-3 days from receipt of payment and print ready artwork. If order and payment is received after 2pm turnaround times will start from the following day. Express Banners can be produced at up to 1250mm high x 5000mm long and are charged at a minimum of £15.00 per square metre. By far the best scaff banners we have bought. Really well made and standing up to the elements. This hardwearing and durable 500gsm pvc banner is printed using high-quality UV print technology. The UV print process allows us to make high-quality durable pvc banners which will stand up to the elements. UV is a very effective way of manufacturing high-quality vibrant banners at very reasonable cost. Prices you see below are the prices you pay guaranteed! Printed heavy duty pvc banners are finished to your specific requirements at no extra cost – with either hems and eyelets or with pole pockets. For more information on banner design, fitting techniques and technical specifications, call us. If you need information regarding resolution then please click here for full dpi and ppi explanations. Standard delivery turnaround is 5-6 working days from confirmation. Need it quicker? Call us for details. Heavyweight and durable, our 500gsm PVC banners are printed using high quality UV print technology. This print process allows us to make high quality durable banners which will stand up to the elements. Simple. All our high quality pvc print jobs are batch processed which allows us to take advantage of the economies of scale. On a daily basis we are processing large format printing jobs from all over Europe. Your job, even if it is a one-off event banner, will be printed alongside dozens or hundreds of others. Crucial to the quality and longevity of any scaffold banner are the methods used to finish it. Traditionally, banners were always stitched. Whilst we still offer stitching (always on fabric materials), we more commonly use high-frequency welding on our PVC scaffold banners. This gives a much stronger, more predictable and more aesthetically pleasing finish than stitching. 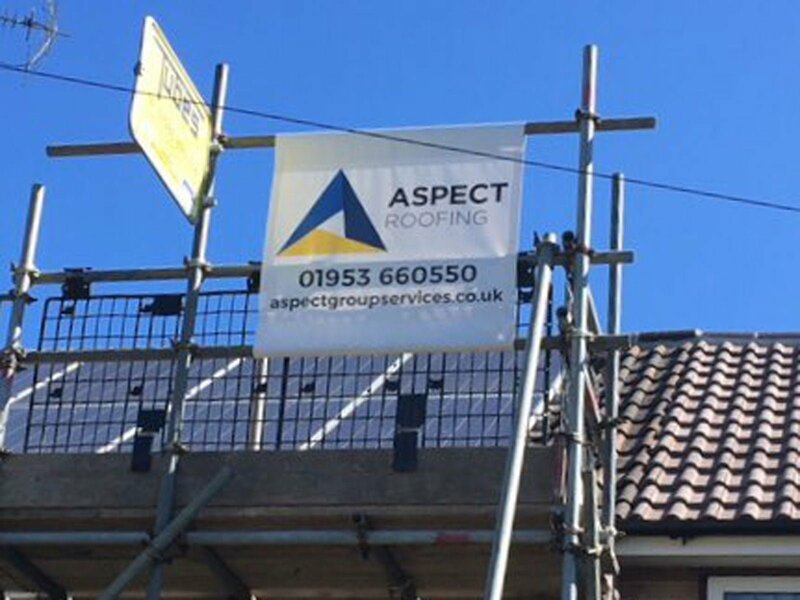 We print Scaffold Banners at sizes to suit your requirements on roll widths up to 5 metres wide. 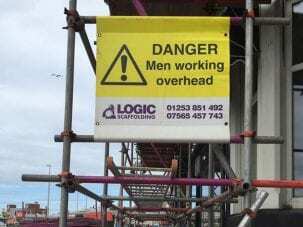 Larger Scaffold Banners are recommended to be made from our Mesh materials to reduce wind-loading. Scaffold Poles Top & Bottom – Smaller Scaffold banners can be secured by sliding a scaffold pole through top and bottom sleeves. The bottom pole can be adjusted to provide tension. Bungee Ties – Bungee or Shock Cord can be run through eyelets on your banners to secure them to the structure. This provides a little give for wind gusts. 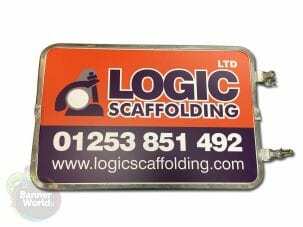 Scaffold Frame & Bungee – a steel wire frame can high-quality though eye bolts approximately 300mm outside the banner. Once the wire is tensioned, the banner can be fitted using a zig-zag of bungee cord. This gives the effect of a trampoline on its side, tensions the banner and allows some ‘give’ for high winds.